This example uses data from Kutner (1974, p. 98) to illustrate a two-way analysis of variance. The original data source is Afifi and Azen (1972, p. 166). These statements produce Output 41.3.1 and Output 41.3.2. 3 3 21  1  . 9  3  . 4 3 22  7 25  5 12  . Note the differences among the four types of sums of squares. 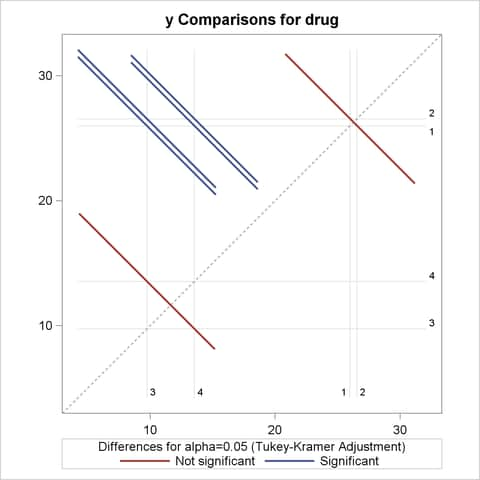 The Type I sum of squares for drug essentially tests for differences between the expected values of the arithmetic mean response for different drugs, unadjusted for the effect of disease. By contrast, the Type II sum of squares for drug measures the differences between arithmetic means for each drug after adjusting for disease. The Type III sum of squares measures the differences between predicted drug means over a balanced drug disease population—that is, between the LS-means for drug. Finally, the Type IV sum of squares is the same as the Type III sum of squares in this case, since there are data for every drug-by-disease combination. 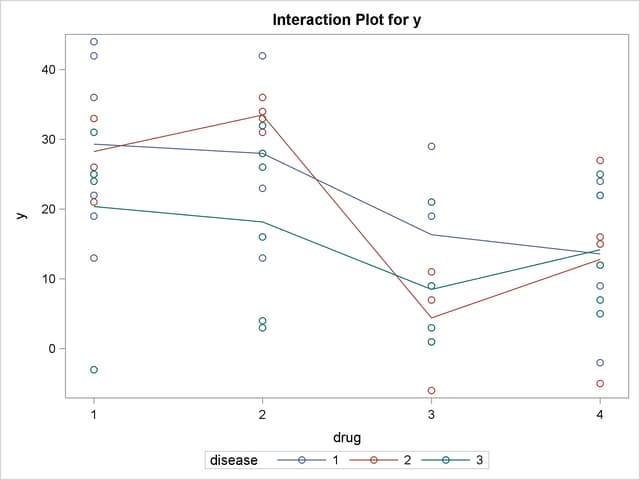 No matter which sum of squares you prefer to use, this analysis shows a significant difference among the four drugs, while the disease effect and the drug-by-disease interaction are not significant. As the previous discussion indicates, Type III sums of squares correspond to differences between LS-means, so you can follow up the Type III tests with a multiple-comparison analysis of the drug LS-means. Since the GLM procedure is interactive, you can accomplish this by submitting the following statements after the previous ones that performed the ANOVA. Both the LS-means themselves and a matrix of adjusted -values for pairwise differences between them are displayed; see Output 41.3.3 and Output 41.3.4. The multiple-comparison analysis shows that drugs 1 and 2 have very similar effects, and that drugs 3 and 4 are also insignificantly different from each other. Evidently, the main contribution to the significant drug effect is the difference between the 1/2 pair and the 3/4 pair. The following statements reproduce the previous analysis with ODS Graphics enabled. Additionally, the PLOTS=MEANPLOT(CL) option specifies that confidence limits for the LS-means should also be displayed in the mean plot. The graphical results are shown in Output 41.3.5 through Output 41.3.7. 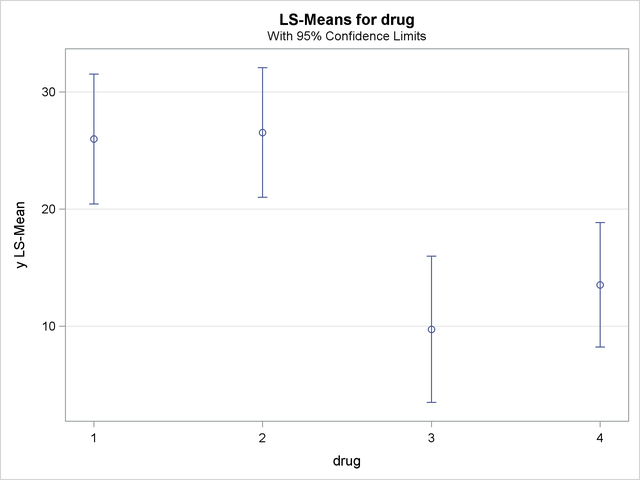 The significance of the drug differences is difficult to discern in the original data, as displayed in Output 41.3.5, but the plot of just the LS-means and their individual confidence limits in Output 41.3.6 makes it clearer. Finally, Output 41.3.7 indicates conclusively that the significance of the effect of drug is due to the difference between the two drug pairs (1, 2) and (3, 4).